Are You Cold? Pour a Cup of Hot Coffee. He’s Waiting for You! Today the bitter cold is the first thing on my mind. 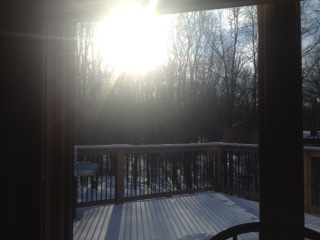 It is -7 degrees here and the sun is making its ascent. What’s it like where you are? Funny girl, you know it’s heavenly where I am. There is no need for the sun here. My brilliance illuminates everything. A crystal clear river of living water flows through the streets made of pure gold. The pearly gates remain open at all times. There is no temple, for I and the Lamb are its temple. There are no tears, or mourning, or death. Only joy and laughter fill the air. I have prepared a place for you. You will spend eternity here with me. When you ponder the confines of earth, dream of this place I have described for you. This is your eternal home. My radiance will bring warmth to your heart. Do not forget, I am with you, even now. It may be cold outside where you are, but my Spirit warms your soul within. Delight in the coziness of a close relationship with me. Soon the ice and cold will melt away, and only the warmth of the Son will remain. Pour a cup of hot coffee, and enjoy a conversation with Me. I’ll be waiting for you. This entry was posted on November 6, 2015, in From God's Heart to Yours and tagged brilliance, close relationship, coffee, cold, conversation, coziness, heavenly, ice, illuminates, joy, laughter, living water, melt away, souls, streets of gold, sun, waiting, warm, warmth, within.